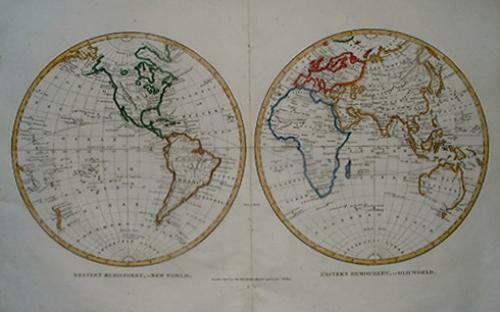 Size: 16 1/2" x 10 1/2"
A very detailed early nineteenth century world map in hemispheres. The map is an original, defined copper engraving with a neat and decorative hand outline watercolouring, printed on medium thick paper with a centerfold as issued. Town names and country borders are shown in detail throughout the map and the partial configuration of Australia is of interest. The map is uniformly age toned with no foxing. A 1" tear with no loss exists in the left margin and has been neatly repaired from the back. Several small binding holes exist in the centrefold. Very light surface soiling mainly to the margins. Light browning to the extremities of the edges. Overall in very good condition.